﻿ Au Cabaret Vert Hotel, Battambang | FROM $40 - SAVE ON AGODA! "The hotel can arrange very good tuktuk drivers with good Eng..."
Have a question for Au Cabaret Vert Hotel? "The eco friendly pool is a great concept and a well kept garden which made it so relaxing to stay." "We certainly felt very cosy and had a lovely stay." "Very good breakfast at a reasonable price." "I loved the fantastic breakfast n home made jam." 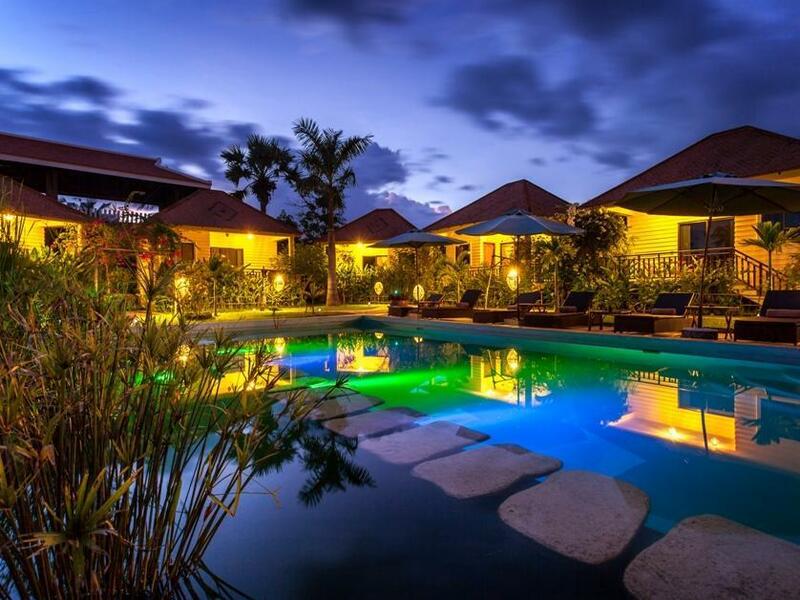 Located in the heart of Battambang, Au Cabaret Vert Hotel is the first environmentally friendly hotel of West Cambodia. All the bungalows of this hotel are very well equipped and are designed to fit the needs of the disabled as well. With all the rooms facing the natural pool, the hotel offers all the guests with a natural and refreshing feel. Overlook the garden while enjoying meals at the terrace. Enjoy all healthy meals at the hotel’s restaurant which uses all the fruits and vegetables planted in their very own organic garden. Not-to-be-missed is tasting the wine of the month while dining. This is the best place for all travelers who wish to stay in a peaceful and relaxing environment, entertained by friendly staffs. "Very friendly staff, good food, cosy settings, beautiful gar..."
We didn't want to leave! Great rooms with balcony to enjoy the wonderful garden views. Very good breakfast at a reasonable price. Our only complaint was the pillows on the bed were too big and made it hard to sleep at night. I loved the fantastic breakfast n home made jam. There was local Khmer food (noodle soup) as well as bread n jam with fruits, scrambled eggs and ham. The lights in the room are a bit dim and our 2 families took a while to get used to it. The eco friendly pool is a great concept and a well kept garden which made it so relaxing to stay. Yes a bit away from the city centre so it is in a quieter area. We enjoyed 2 nights there. I is a quiet place not in the city center. Personnel is really helpful and makes your stay very comfortable. They also arrange efficiently booking and tour. Just ask and it's ready. We warmly recommend this address. stayed here for 3 nights. Bugalows are well fitted with everthing you want. Beds very comfortable and good pillows. staff very friendly. Ihave never heard so many insects at night. the hotel in very quiet area. 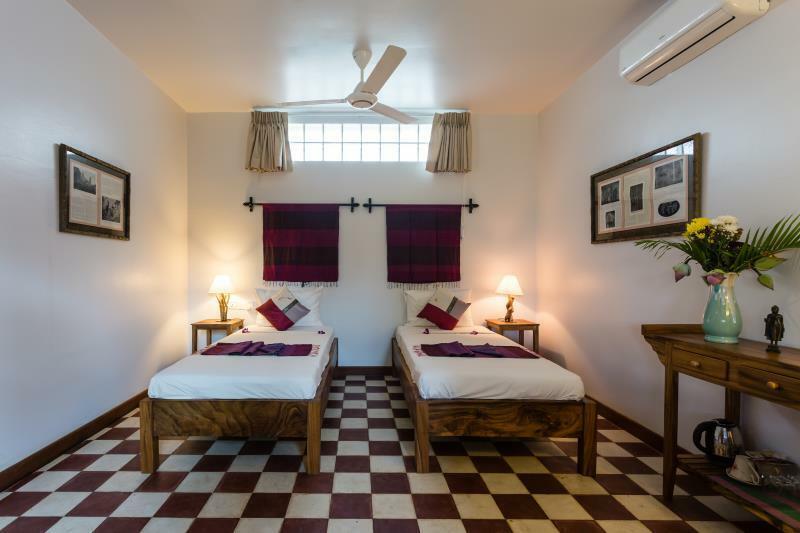 Au Cabaret Vert is a wonderful bungalow style accommodation located in the city centre of Battambang. The style and decor of the place is a great change from the regular hotels/resort. It is rather small with only 10 rooms. But the owner put a lot of thoughts into designing/decorating the place. The pool is icing on the cake. It looks just too beautiful. Le patron, Mathieu est très sympathique et de bons conseils, petit déjeuner parfait! Jolis jardins avec piscine très bien entretenu Les enfants ont adoré se faire nettoyer les pieds par les poissons! Bonne adresse!!! We loved the beautiful tropical gardens that surround the pool, and the cute bungalows made us feel like we were on an island! Super friendly owners and great breakfast too. Absolutely quiet and beautiful. Fantastic food and service! Having gotten used to great hotels in Siem Reap, this more rustic than I like. The shower is only a hand held. The bed just ok. The owners & staff could not be nicer. And the only reason we went was for the bat caves, which are amazing. We stayed for 1 night. The hotel has a cosy feeling. The owner was at the reception to greet us when we checked in. Staff were all friendly and helpful. Food was quite good. It is about 15 minutes by tuk tuk to town centre so we ended up eating both dinners at the hotel. Value for money was very good. Small, well run hotel. The Villa units were very good and very clean. Staff friendly and welcoming. Breakfast more than enough to sustain you for the day. Nice touch - a plate of fresh fruit on your table. Location - walking distance to the river- or centre of town.This hotel a little gem. Note - be aware that the front gate is locked late at night. There is nowhere in the Hotel information that tells you about this - and I was locked out. There is no bell to inform the security guard- so if this happens to you - just shout! Or tell the staff before you go out that you will be late back. For staff performance - I'd give a 5, but only giving 4 because of security guard not hearing us. We all loved staying here, in fact it was a highlight of our holiday. The hotel is well designed and is made up of 7 individual bungalows, nicely spaced apart, each with it's own raised outdoor terrace. Inside the bungalows are light, airy and clean. Several things make this hotel stand out from the crowd. Firstly, the warm and enthusiastic welcome. Secondly, the European owners live at the hotel and are very hands on. Thirdly, we loved the pool, our son could hardly keep out of it. It is an Eco-pool which means that the water is very soft and if one doesn't splash around too much, the fish will come out to have a look at you. Fourthly, Cabaret Vert can organise very creative excursions. The handcrafts trip is a must and we were also able to go kayaking down the Mekong. Finally, we loved the food. Thank you Au Cabaret Vert! this hotel is just a little out of the main city centre but it is easy to get to by tuk tuk. our room was large, comfortable, good bathroom ad a very unusual attractive rattan ceiling - spacious and airy - good ac too. welcome cocktail on arrival. "natural" swimming pool had fish in it but once you get used to that the water is silky and no smell of chemicals. the garden area is lovely - quiet and well looked after. service is friendly and welcoming. i rented a bike for the day and it is easy to get out of town - lovely countryside after a couple of miles. excellent freshly cooked to order breakfast. highly recommended. Whilst travelling to the hotel you really wonder where you are going right to the heart of the industrial area. But that is where it stops. You proceed down the side and what a surprise. We only stayed the one night and after staying in both Phnom Penh and Siem Reap I wish we had stayed longer. The owner made us feel more than welcome and the friendly staff organised tours at extremely short notice to the Bamboo train and around the town by Tuk-Tuk. The food was delicious and the cocktails superb. The rooms comfortable in a small town. If you want somewhere that the owners inject that homely feel then stay here and just enjoy. We came away feeling like we had left behind friends even after one day. Thank you. Amazingly friendly staff and owner; Style is French and local, rather than boringly western; first non-chemical pool in the country. On the edge of town, so it's quieter. Distance is irrelevant in this town though, since tuk tuks cost nothing to take you anywhere. The people are lovely and excellent hosts. Rooms have all comforts that you expect, but their style is not the boring western-hotel wannabe. Dining is French and local cuisine - great! very welcoming and helpfull staff and owners, very pleasant rooms, excellent food, green swimming pool. 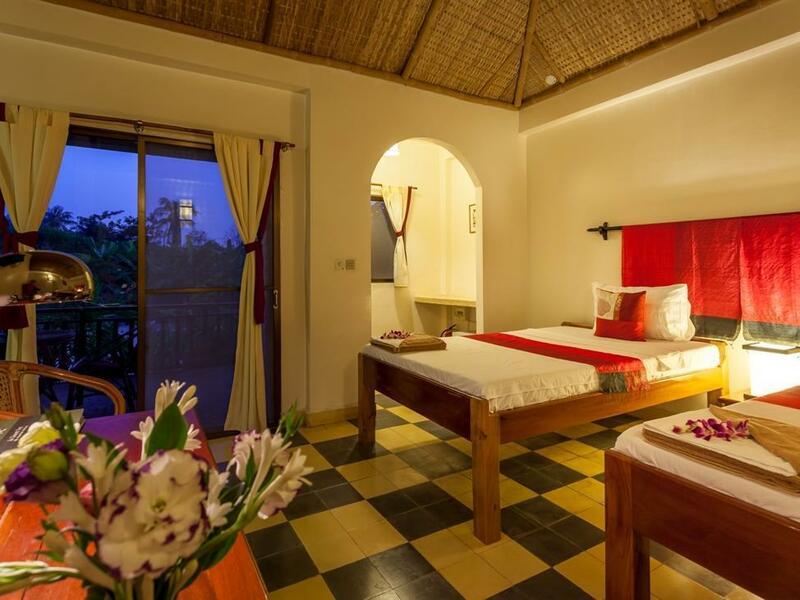 very comfortable stay: the hotel is pleasant, with nicely decorated small 1-room bungalows, around a green swimming pool. restaurant on a ground floor terrace is very good with a menu offering both khmer and french specialities prepared by a very good chef, at reasonable price. the owners, a franco-cambodian couple, are very welcoming and helpfull. being located sightly away from the center of the town, you need to order for a tuktuk by phone, which is actually not an issue as you get one in 5 minutes. Au Cabaret Vert is a diamond in the rough. For the price they charge you get a beautiful room, location, pool, atmosphere, was definitely one of the highlights of our stay. The french owners are super-friendly and the food is fantastic. It's a little outside the main area of Battambang which we liked, and it's only a 10 min walk or a 2 min tuk-tuk ride into town. Would definitely come back here if we returned to Battambang. C'est magnifique!